Saturday evening was the occasion for the annual dinner to celebrate the birthday of the founder of the Elizabethan Club. I was there, without a date this year. It was a lot of fun. 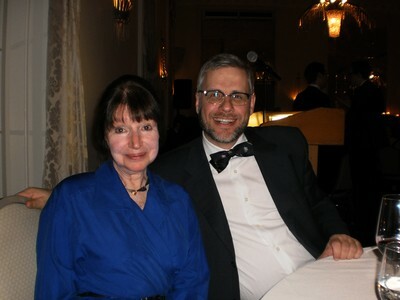 I had the privilege to dance the first dance with the Club's president, next to whom I was sitting during dinner. Very good food! 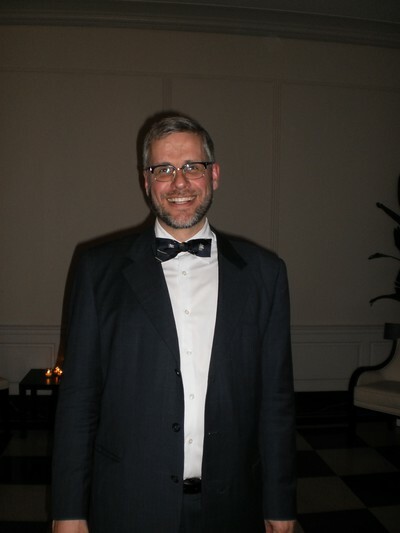 I danced a lot afterwards with several friends, and I went to the afterparty. That was a rather noisy but sincere affair. I stayed for a while, then waited for an eternity for a taxi. All in all a fun experience. So how about that beard, should I keep it? Notice the Elizabethan official bow tie! 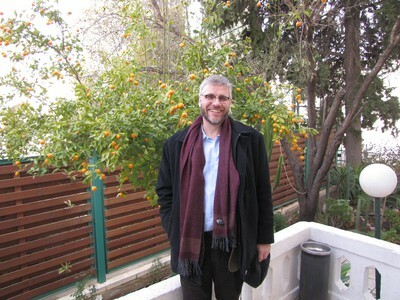 I have been to Jerusalem for a conference. Such a relief to get to a warmer country for a while to get away from the bitter cold of New Haven. 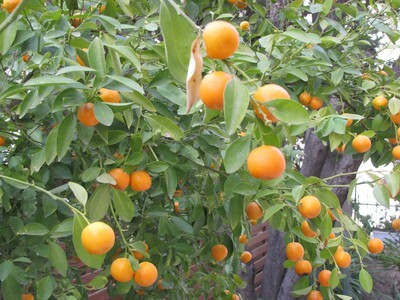 The oranges were growing in the garden of the French research centre of Jerusalem, where we had Wednesday's sessions. 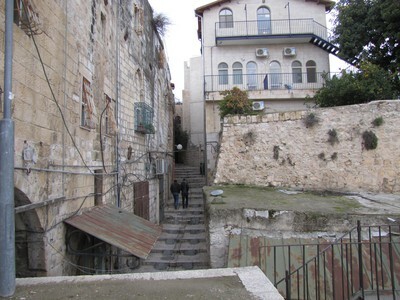 The Old City of Jerusalem was really remarkable and enormously interesting to anyone with historical interests. 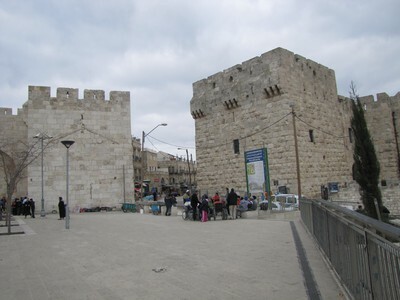 It is surrounded by an Ottoman city wall from the sixteenth century. 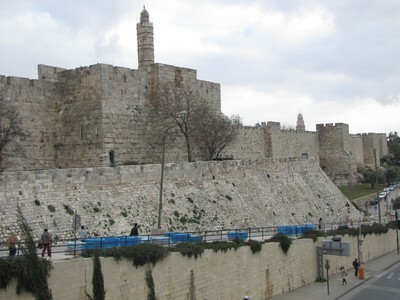 Here one can also see the so-called Tower of David, so called by the Crusaders, although it is certainly not old enough to have been built by David. The Jaffa gate (for this was the beginning of the road leading to Jaffa) with the hole that was taken up in the wall for Kaiser Wilhelm II's visit. The city itself is a labyrinth of narrow streets which are laid out on a grid dependent on the Roman city plan (if not older). 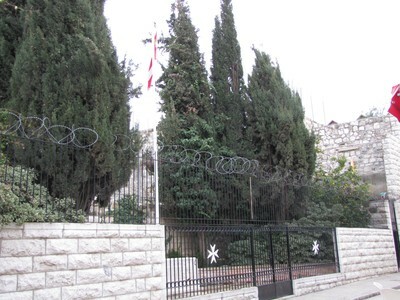 The site of the Hospital, built by the Order of the Hospitallers after the Crusaders had taken Jerusalem in 1099. 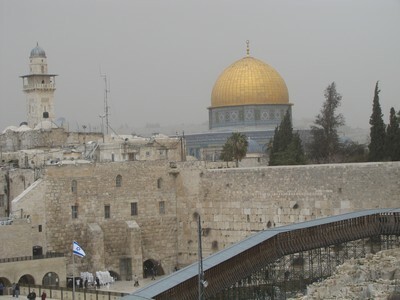 A view of the golden dome of the Al Aqsa mosque and below it the Western Wall, that is the old retaining wall for Herod's second temple of Jerusalem (the first one having been destroyed by the Babylonians, this one almost entirely destroyed by the Romans). 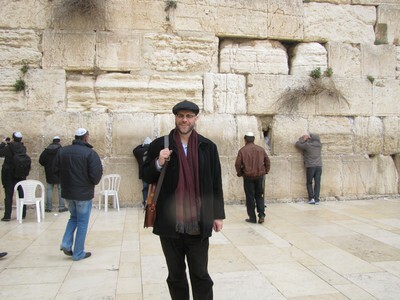 Me in front of the Western Wall (the Wailing Wall). Enormous stone blocks that were put there by King Herod. 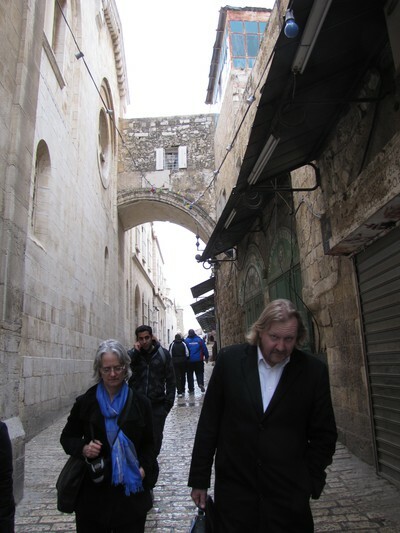 One of the main attractions of Jerusalem for a church historian is of course the places that are assoicated with the life, but even more the death of Jesus. Many places are pointed out as significant in the history of the "Passion of Christ," but the identifications rest on rather shaky grounds at best, if they are not simply based on misunderstandings. 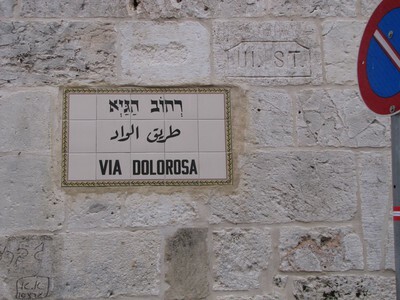 The Via dolorosa is, however, identified on street signs. 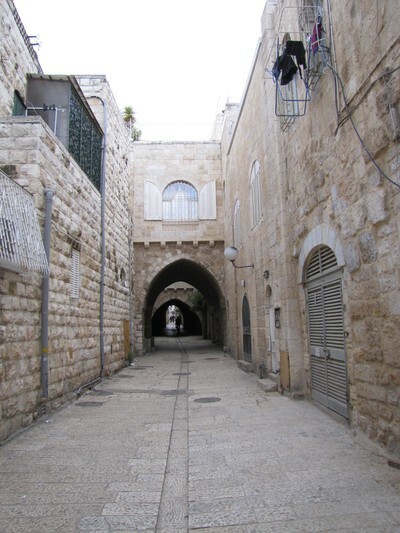 Over the Via dolorosa is an arc, which actually is a Roman triumphal arc that has been built into the buildings on either side. 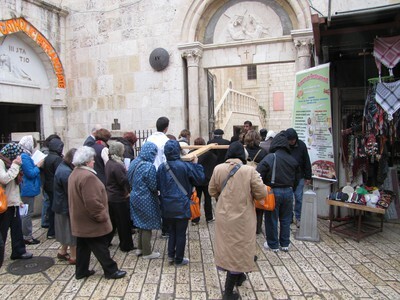 From the supposed place of Jesus' judgment to the supposed site of Golgotha, pilgrims carry small wooden crosses to reenact that scene in the "Passion of Christ." Here they are at the Armenian patriarchate, as is announced with the bright orange letters to the left. 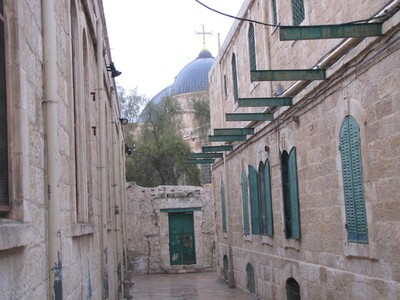 Eventually, one gets closer to the Church of the Holy Sepulchre, whose domes are visible here. 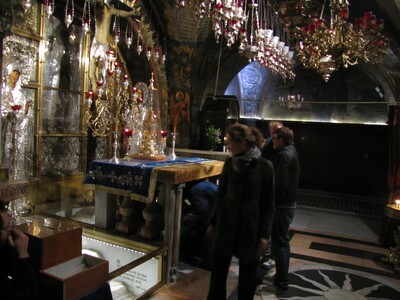 The church complex (built over time to become a maze of rooms) encloses not only Golgotha (the site of the crucifixion), the grave in which Jesus was buried, and the site where Emperor Constantine's mother Helena found the True Cross. This is the side of the church with the main entrance, on the southern side. 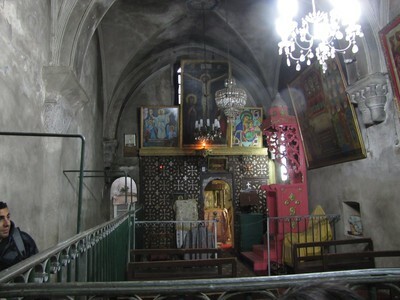 One of the chapels of the Ethiopian Church. 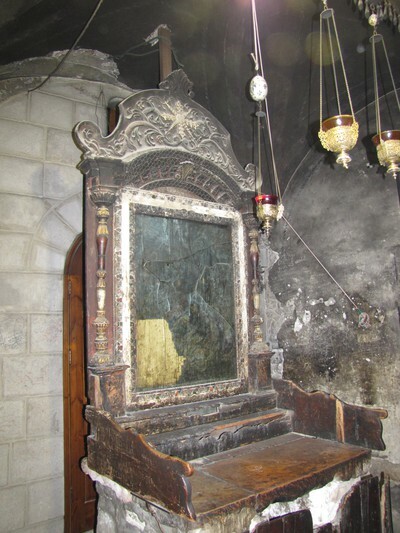 The altar of the Golgotha. One glimpses a man who is under the altar. He is putting his hand down into a hole where there is a cavity in the rock, supposedly the spot where Jesus' cross stood. 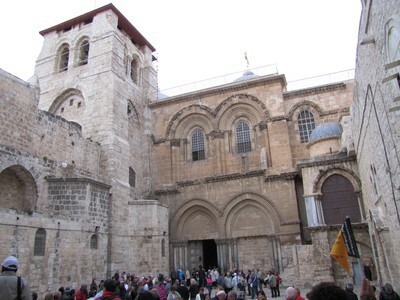 The Church of the Holy Sepulchre is of course a place and a building of eminent sacredness to Christians of all denominations, and thus the building is shared in brotherly Christian love between at least six churches (Greek, Catholic, Armenian, Syrian, Coptic, and Ethiopian). Every now and then violence breaks out between representatives of the different churches, as for example in 2002, when a Coptic monk moved his chair out of the sun into the shade. This was interpreted as a hostile move to take over more territory by representatives of the Ethiopian church, so a fist fight broke out. Eleven were taken to the hospital. In 2004, Franciscans and Greek Orthodox were fighting, with several arrests as a result. In 1853, the Ottoman sultan was so tired of all the squabbling among the churches, so he decreed that the way the church was divided among them at that point was going to apply also in the future. I suppose that he in that way avoided having to listen to more arguments about why a specific church should have the right of a specific chapel or room. Unfortunately, not everything became clear through this decision, which is still in force. The result is for example this little chapel to the east of the main grave. It was damaged in a fire in 1808 (our guide claimed), but it has not been renovated, for the churches cannot agree on to whom this chapel belongs. Dinner on the Wednesday at Arkadia restuarant. 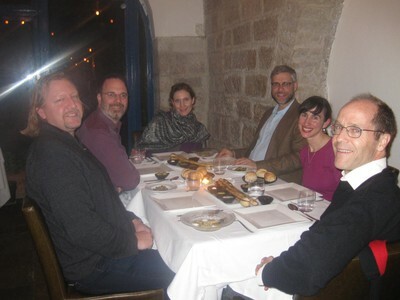 A very good meal with very good wine, all non-kosher, with very good friends. Before going to Jerusalem, I spent a day in Tel Aviv. 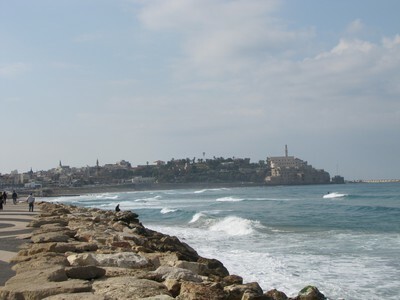 Here is the Mediterranean with the ancient port city of Jaffa on its peninsula in the background. 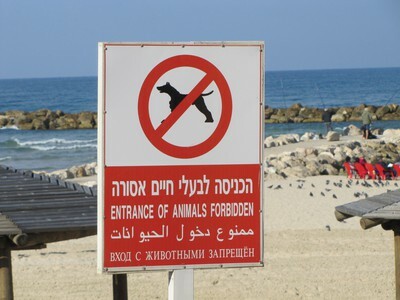 Visitors are encouraged to keep their animals off the beach, in four languages with four different script systems. 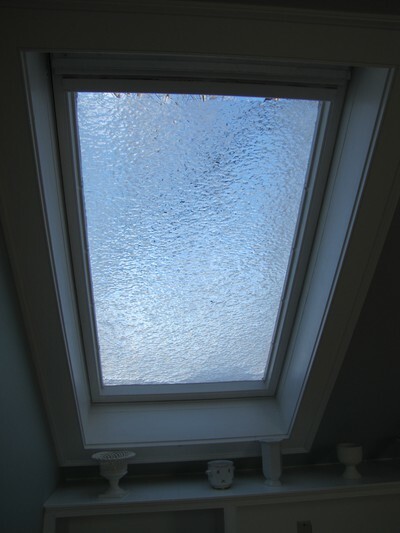 This is what one of my skylights looked like after one of the hugest episodes of ice rain (underkylt regn) that I have experienced in New Haven. Very pretty, I think. 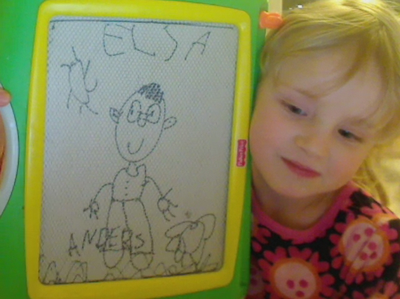 Idag har jag pratat på Skype med sötaste Elsa, som ritade en bild av mig. Hon är jätteduktig på att rita och skriva!